The municipal office in Bielsko-Biala, a picturesque town in southern Poland, has implemented an Esri-based system to inventory all the resources in its broadband network, including devices, cables (their location, size, type, and attenuation parameters, for example), and infrastructure (such as buildings, cabinets, cable chambers, manholes, and utility poles). Suntech S.A., an Esri Silver Tier partner, used its SunVizion Network Inventory to map out the municipality’s entire broadband network so that, as the municipality expands its Internet services, it will be able to better manage its network infrastructure, reducing maintenance costs and streamlining business processes. Bielsko-Biala’s broadband network was actually built in 2014. It has a high-performance fiber-optic backbone, and its distribution network has radio access elements and access nodes for future broadband operator installations. The network is designed to meet an array of local government requirements, including providing public e-services, such as online permitting; hooking up municipal administration buildings to one another; and connecting schools to other educational institutions, including social assistance centers, cultural organizations, and libraries. It also advances the idea of Bielsko-Biala being a smart city by allowing the future installation of more than 90 monitoring points that can be used to intelligently manage road traffic by, for example, notifying drivers of commute times and alternate routes and showing estimated bus arrival times. Additionally, part of the network’s passive infrastructure makes portions of it available for other telecommunications operators to lease at market value so they can offer broadband services to their customers. To ensure that the broadband serves the town’s population effectively, the telecommunications companies that offer network-based services need access to detailed information about network assets, including the layout of the cables and data about where network devices are located, as well as the devices’ parameters. And they need this information on the spot. SunVizion is devised to facilitate close cooperation and information sharing among the numerous entities managing and using a public broadband network. The system allows network managers to instantly see information about available network resources near a client’s residence, which makes it easier to determine service options at the outset and, if a customer experiences issues, reduces the amount of time it takes to give a technical diagnosis. 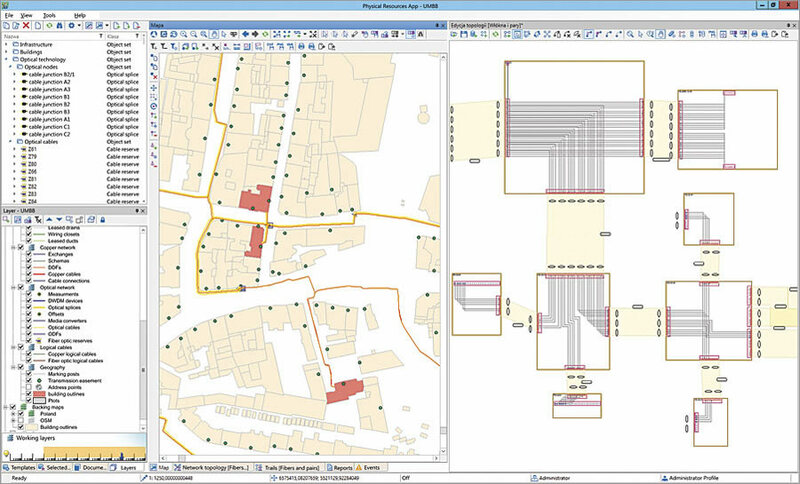 SunVizion, which works with ArcGIS 10.3 for Server and utilizes a host of other Esri products, employs GIS for the spatial components of network management, including recording network elements. The system goes even further when a customer already uses the Esri platform because SunVizion can be integrated with the client’s existing ArcGIS environment. All customers have to do is configure their feature classes and maps to appear in SunVizion and migrate selected geodata into the system’s repository. In the event of a device failure, the digital map of the network—displayed on a client’s own system or on ArcGIS Online, complete with full data about the network—makes it easy to identify the location of the failure and shortens the time it takes to remove the device and fix or replace it. Using the geographic data for each device (which is collected along with its technical data), the system quickly defines the extent of the failure by showing which services—Internet and/or telephone—will be unavailable to clients in specific areas. Additionally, a swift analysis of the extent of the failure allows the system to localize the problem so it can be taken care of right away. At the same time, network operators are able to contact clients whose Internet or telephone connections were cut off and provide them with a complete picture of what happened and when they expect the failure to be remedied.